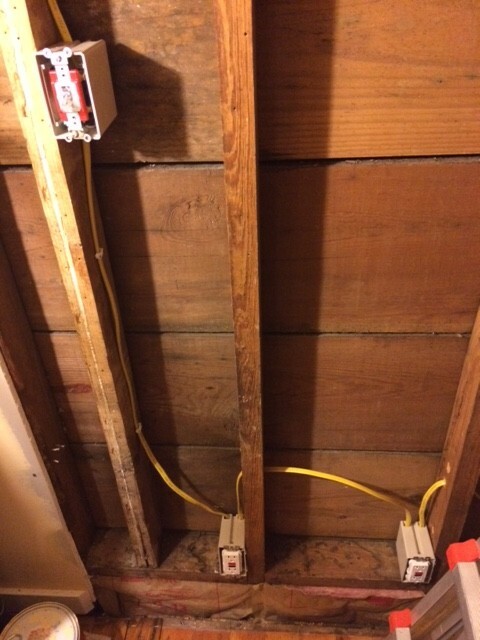 The Great Coat Closet Remodel Project – Outlets and Switches and Romex, Oh My! In my last post, I showed you the latest progress in The Great Coat Closet Remodel Project. I had installed the electrical boxes and drilled holes to run the Romex. As it turns out, I had forgotten that 12/2 NM is not quite as flexible as 14/2. When I started running it, I immediately encountered difficulty trying to bring the NM into the boxes. The holes that I had drilled were too close to the top of the boxes. So I had to drill a couple of new holes several inches above the boxes, to allow better clearance for manipulating the NM. 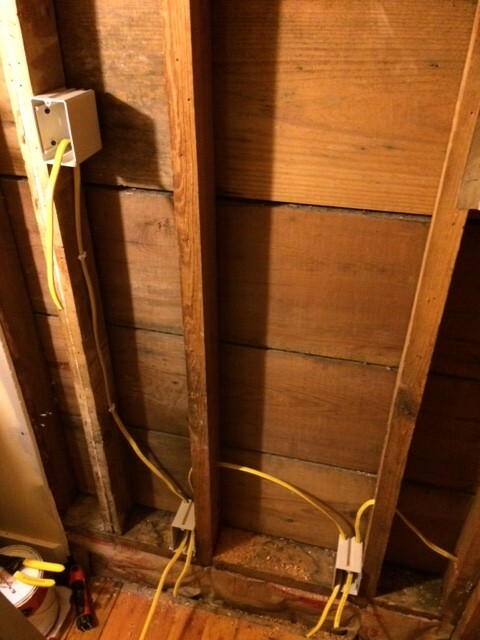 … and across the interior wall to where the junction box will be installed. Where the NM ran vertically along a stud, I attached it with Romex staples. 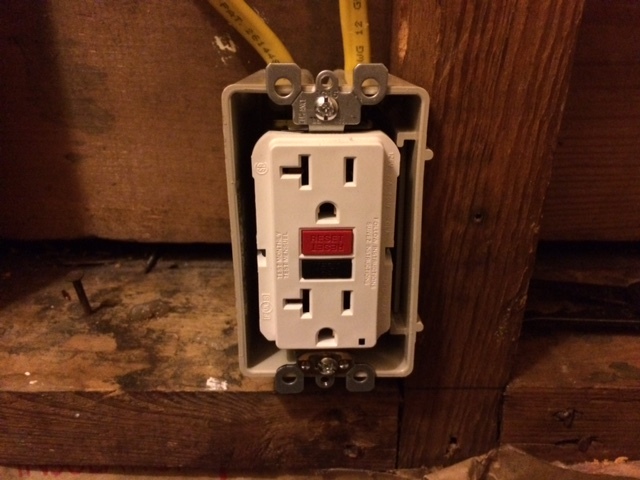 With the Romex in place, I was ready to install my two GFCI outlets. I stripped the outer sheath from the Romex, and then stripped about 3/4″ off the black wire and white wires. 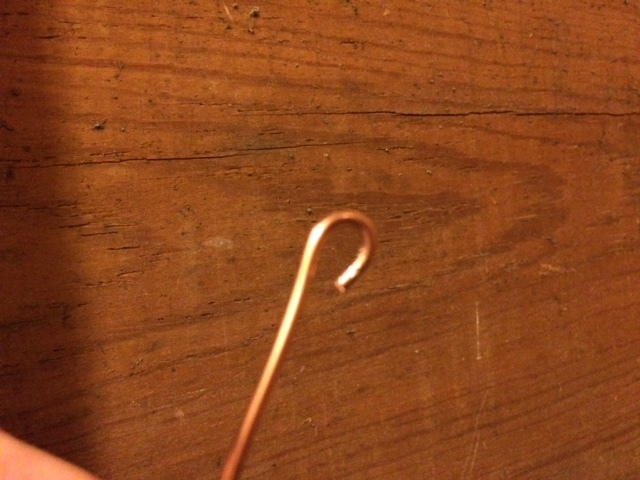 First, I took an extra length of ground wire and, using my needlenose pliers, made a clockwise hook at the end. I slipped the hook around the green ground screw on the outlet, and tightened the screw to lock down the wire pigtail. Tip: If you make the wire hook clockwise, it will lock the wire down securely when you tighten the ground screw. 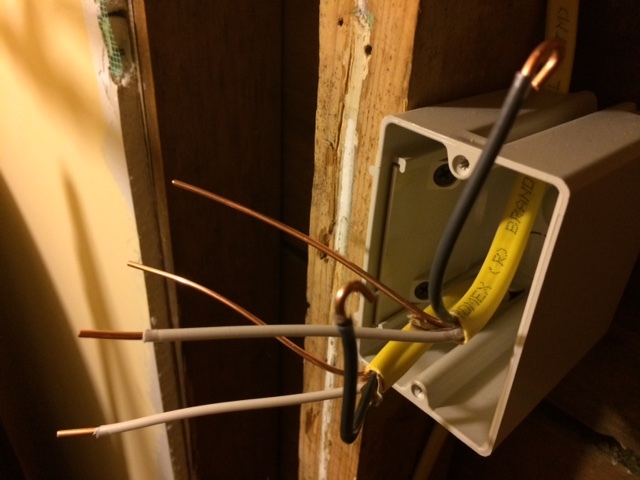 Next, I needed to connect the ground wire pigtail to the line (incoming) ground wire and load (outgoing) ground wire. This was the first time that I have had the opportunity to use my push-in wire connectors. 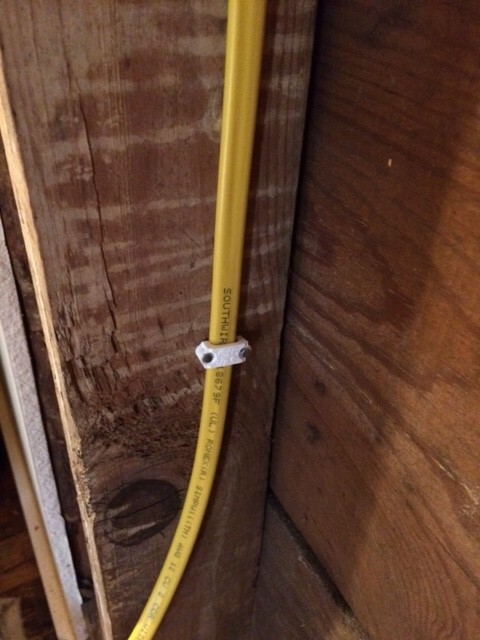 They were pretty straightforward to use – simply push the wires securely into the holes of the connector. 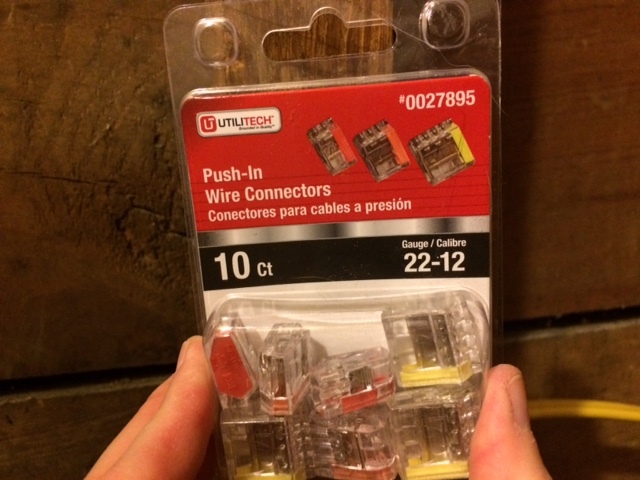 The connectors in the multipack that I bought came in different sizes, for two, three, or four wires. 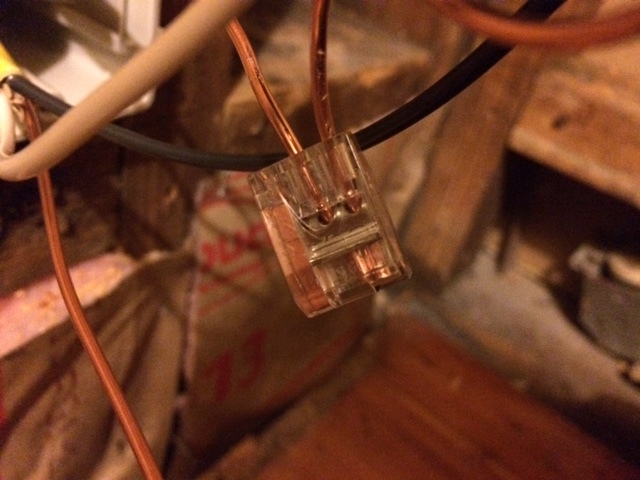 I used a three-wire connector for the three ground wires. 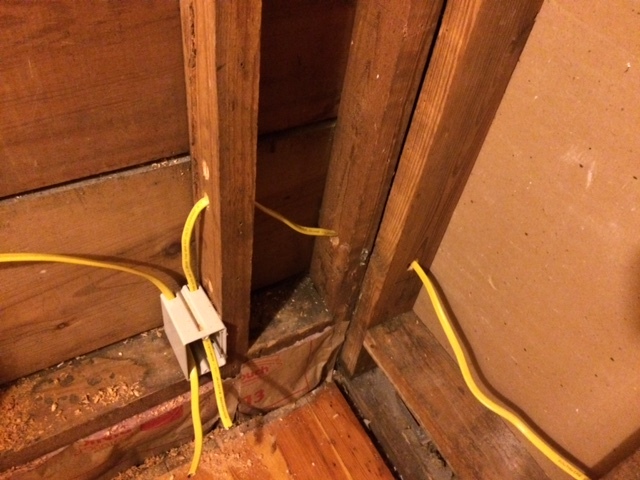 I used my needlenose pliers to help push the wires in fully. 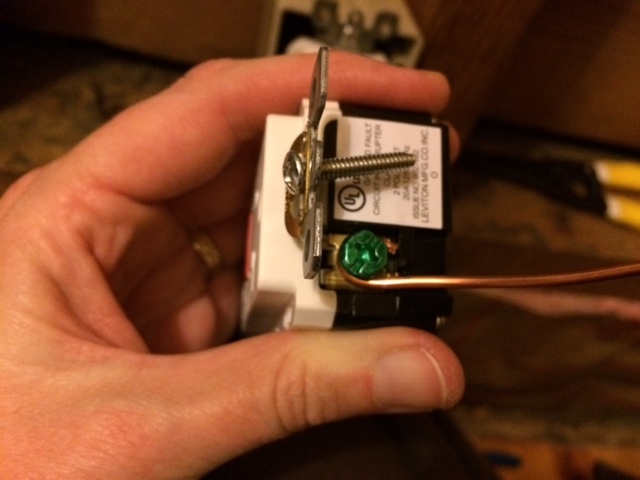 I decided to use the push holes on the back of the outlet rather than the terminal screws. 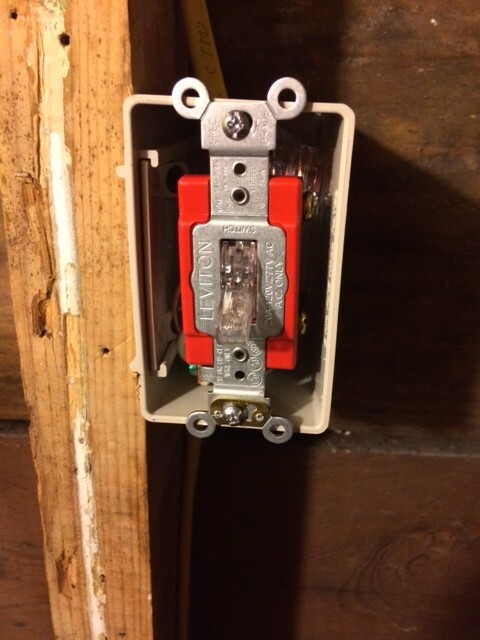 I connected the incoming black wire and white wire respectively to the hot and neutral inserts marked LINE on the back of the outlet. I tightened down the screws securely. I then connected the outgoing black and white wires to the LOAD inserts, and tightened the screws. I gave all the wires a good tug to make sure that they were securely fastened. 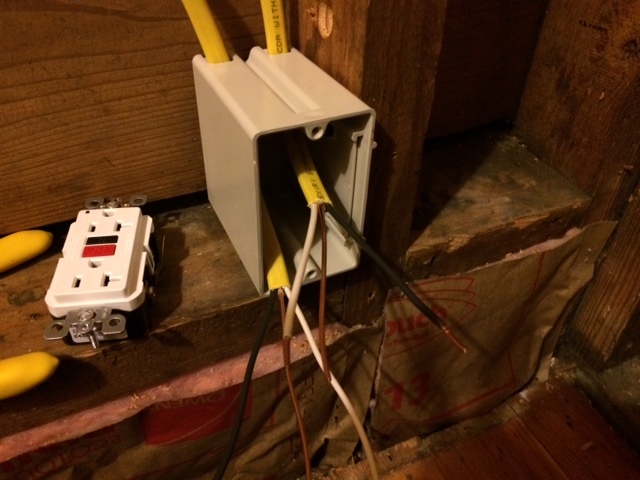 I then folded the wires back into the electrical box and screwed the outlet into the box. I then repeated the procedure with the other outlet. 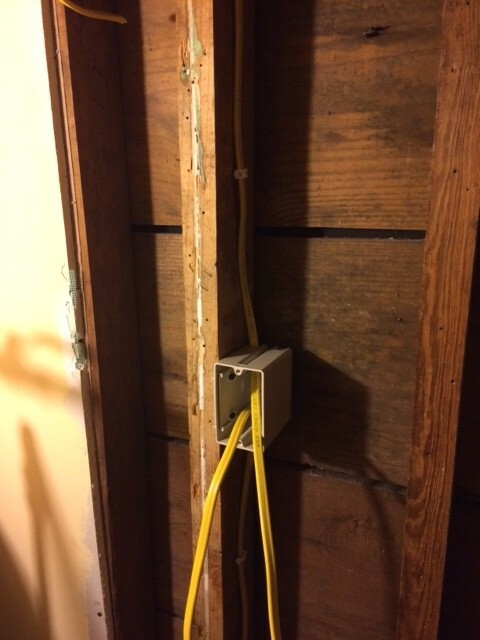 With the outlets installed, it was time to move on to the switch. First, I needed to run another length of NM from the switch box up through the ceiling joists to where the pot lights will be installed. I secured the NM with more staples. 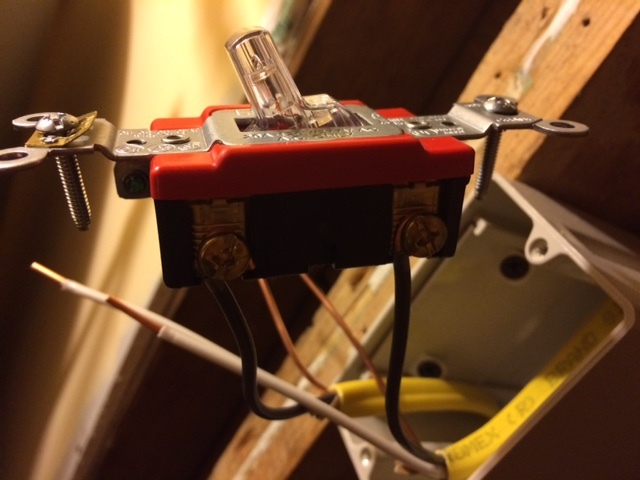 Unlike outlets, switches usually don’t have push-in connections. I used my needlenose pliers again to make clockwise hooks in the black line and load wires. I attached the line and load wires to switch terminal screws and tightened them securely. I created another ground pigtail and attached it to the ground screw on the switch. 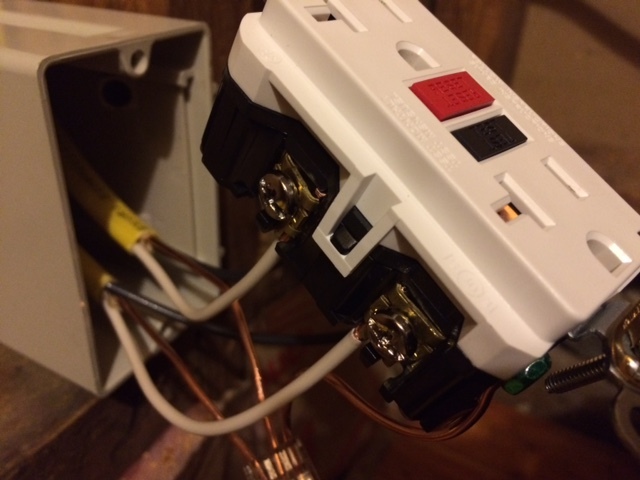 I used a three-wire push-in connector for the line, load, and pigtail ground wires, and a two-wire push-in connector for the line and load white neutral wires. 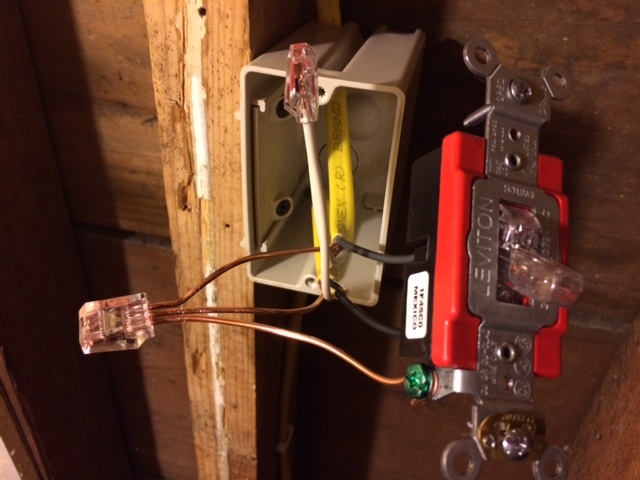 With all the wires tightly secured, I folded the wires back into the box and secured the switch with the provided screws. 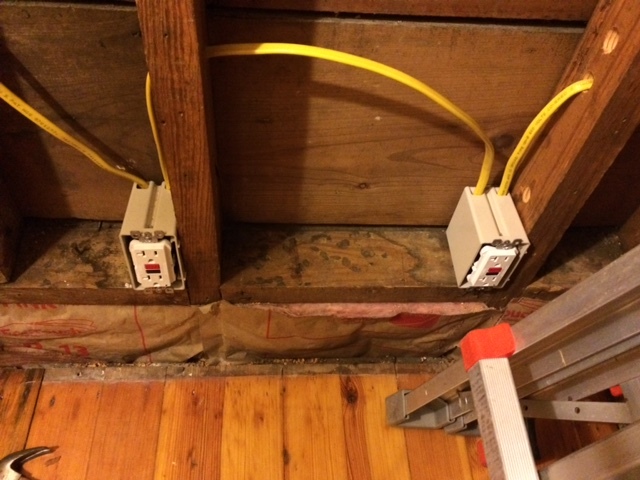 Before I install the switch and outlets plates, I will use my level to make sure that all three are level and plumb. 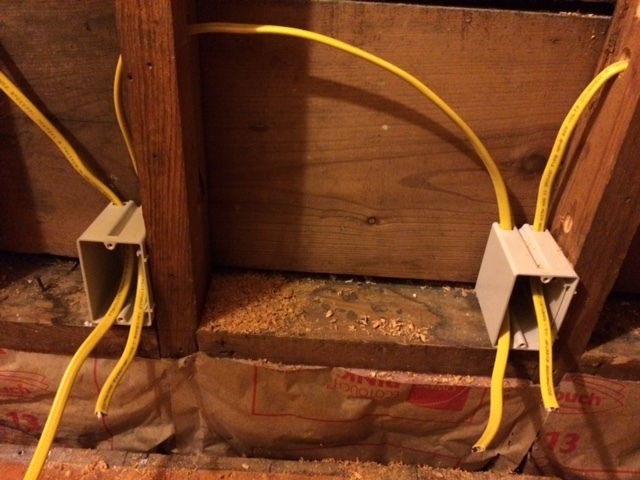 Here are the outlets and the switch, installed and wired, just waiting to be tied into the incoming power. Next, I will install nail plates over the studs through which the NM passes. Then, I will be ready to install the rest of the insulation along the outer wall. 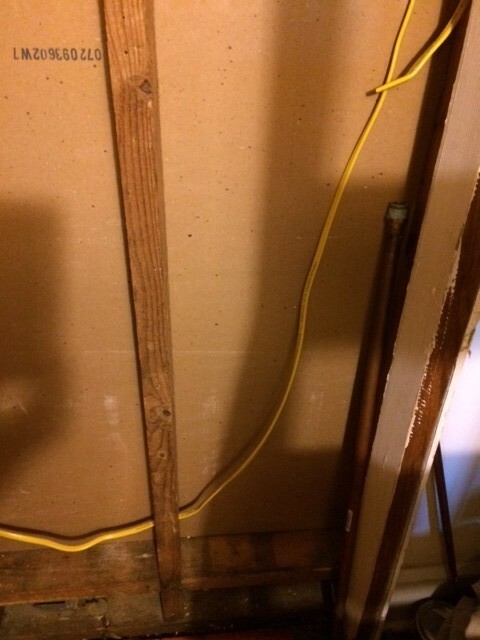 The Great Coat Closet Remodel Project – Insulate Me!